All of our recommended electric fires have been tested for temperature control, safety, noise, and ease of use. We also have included a 'best budget buy'. 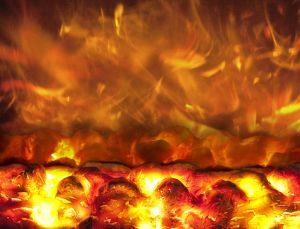 Fitting: An Inset electric fire is usually a fan heater (so will be slightly noisy like all fan heaters) with a flame effect, hearth types mimic a traditional open fireplace, wall hung types give the impression of an open fire sunk into the wall. Some of the Fires reviewed here are fixed and need specialist electrical installation. Thermostats: Unless you have a room thermostat connected to the fire it will not be accurate as it's measuring the temperature at the heater, not the ambient room temperature. A range of portable electric heaters & free standing fires can be found at The Home Heating Shop, along with more electric fire reviews and an in-depth look at the different types. You'll also discover how to choose the right portable electric heater for your needs and how they work. 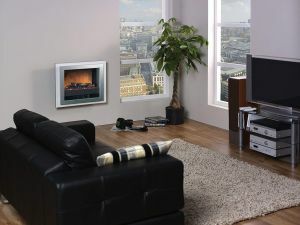 Dimplex Dakota 2kW Inset Electric Fire. Budget does not mean the cheapest, it means the best value for the least money. 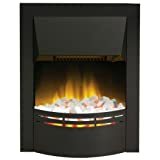 We have selected our budget model from a UK company Dimplex, the worlds leading manufacturer of heating appliances, they have been making heaters since 1973. All their heaters are BEAB approved and Dimplex heaters have stood the test of time. The Dakota is a sturdy, well-made inset electric heater which features the patented Dimplex 'Optiflame®' living fire effect (which can be used without the heater), this gives a highly realistic living fire effect. 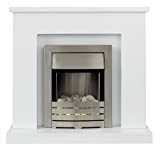 Featuring a stainless steel fret, trim and canopy and a white pebble fuel bed, this Inset Electric fire is designed for standard 16" and 18" fireplaces, and only requires an inset depth of 70mm. The heating is delivered from a hidden fan heater with 2 heat settings (1kW & 2kW), there is a safety cut out to prevent it overheating. A Dimplex Slate Effect Hearth Pad placed under your electric fire protects wood floors and carpets from heat damage and enhances the appearance of the fire. 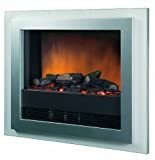 The Dimplex Bizet is a wall mounted glass fronted, contemporary, flame effect electric fire finished in silver-grey with a clever reversible frame to give the option of either a gloss black or gloss white finish. The Bizet has a concealed fan heater delivering a 2 kW heat output with a choice of 1 kW or 2 kW heat settings, a thermostat and remote control (range 15 meters). 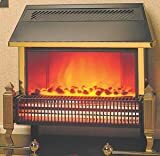 In addition, it has the Dimplex patented electric flame effect, 'Optiflame®', complete with a log effect fuel bed (this can be can be used independently of the heater). This versatile electric heater can be either wall mounted and plugged in using a standard 13 amp plug or recessed into the wall (inset), and hard-wired into a socket, you will need an electrician to do this. The Bizet also has a thermal safety cutout which prevents this electric heater from overheating. Adam Lomond White Surround with Brushed Steel Helios Electric Fire. This is a complete fireplace suite featuring the Adam Helios Brushed Stainless Steel 2 kW electric heater, with a glow effect pebble fire bed, mounted on a black backing plate and set into the white Adam Lomond surround. Adam is part of the FIRED UP cooperation, a British company, Adam is their fire & fireplaces division producing heating and electric fireplace products which are supplied internationally to the home improvement market. This suite is suitable for fixing to a flat wall and is delivered ready assembled, so you just pin it to the wall and plug it in, no further assembly required. The Helios heater (available separately) has a hidden fan heater delivering 2 kW with 2 heat settings (1 & 2 kW). The pebble glow bed can be used separately. The Helios has a safety thermal cut out which prevents over-heating. Celsi is part of the BFM Europe group who design and manufacture gas and electric fires under 8 established brands including Flavel, Verine and Global fires. 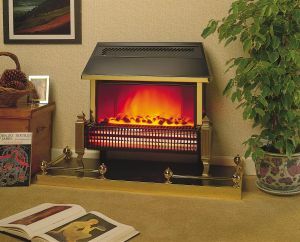 The smoky and relaxing flames give your room a fantastic ambience and can be used independently of the heater. Featuring four separate brightness levels and high-efficiency LED lighting, these electric heaters flame effects are economical to run. With a choice ranging from highly chic wall-mounted 'hang-on-the-wall' fires, to classically designed hearth mounted fires, there is a Celsi design to suit any home. We trailed a mid-range wall hung model from the Electriflame range and were impressed both by the superior finish of the product and by the flame effect. Celsi electric heaters also come with a 2-year manufacturers guarantee. This is the XD Landscape model in black with a variable flame dimmer with four settings, 2 heat levels fan heater (0.9 7kW & 1.8kW) and a flame effect only setting. The XD Landscape can be operated via remote control handset or with manual controls. 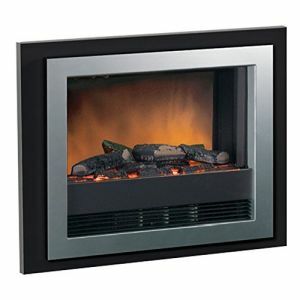 This electric fire Includes an easy fixing wall plate for trouble-free installation. All the previous electric fire reviews are for fan heaters, the Dimplex Lymington is a top model combination radiant bar fire and convector heater. The Lymington has a long history of customer satisfaction and reliability, in production for over 20 years with little change apart from upgraded controls and the introduction of Dimplex 'Optiflame®' to give a more life-like living coal fire effect. We have reports from consumers who have had 15 years+ service from these models. The heating elements and bulbs are all replaceable and can be purchased from Dimplex online or from one of their network of approved suppliers. The heat output is a total of 2.5 kW, 2kW radiated ( 2 settings 1.335 kW & 2 kW) heat & a 500-watt convector heater, the heaters can be used separately or together. This electric heater has an economiser function which once set uses a thermostat to manage the radiant & convector elements to keep the room at your chosen temperature. The Lymington is an elegantly designed high-quality electric heater with timeless styling, finished in matt black with brass effect trim. 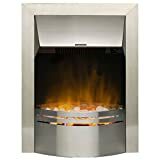 The unique Dimplex 'Optiflame®' living coal fire effect can be used independently of the heater.